Pictures from Google image search. 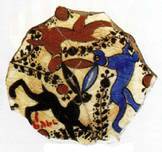 A circular symbol involving three hares chasing one another joined by their ears, the Three Hares is a motif that occurs in the Middle and Far East, as well as in the churches of south west England, Germany and France. As an optical illusion it is appealing in its simplicity. There are three hares, each appearing to have two ears, yet there are only three ears shared between them. But it is in the many speculations regarding its history and symbolism that the true mystery of the Three Hares resides. Examples exist dating as far back as the Sui Dynasty in China (6th Century). It appears on 13th century Iranian coins and Mongolian metal work, and can be found carved in the rafters of medieval churches in Devon, England. It has been hypothesized that these hares traveled from east to west along the Silk Road, printed on textiles as well as on ceramics and metalwork, taking on a variety of meaning along the way. Yet there are others that claim the Three Hares originated in England. Within western churches, most commonly in the Dartmouth region of England, the symbol is displayed prominently, often seen to represent the Holy Trinity. It is this Christian understanding of the Three Hares that James Riordan eludes to by showing the symbol alongside his translation of Le Roman Du Lievre, while more literally it serves to illustrate Hares leap into heaven, his time searching for paradise and his eventual return to the natural world. For more pictures and information regarding the Three Hares be sure to visit The Three Hares Project at www.chrischapmanphotography.com/hares//.